LEARN MORE about this piece, including the story Heartfield’s son told the curator. 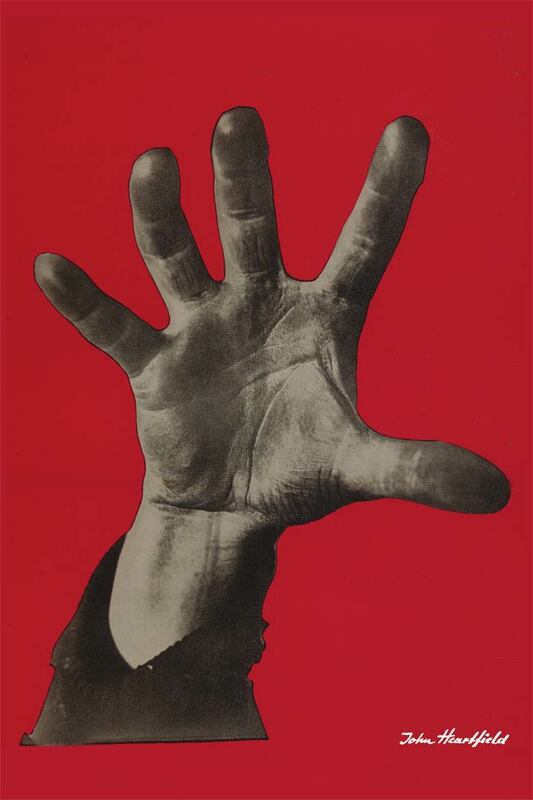 The text on Heartfield original collages translates to: “5 fingers has the hand! With these 5 grab the enemy!“ The “enemy” was the Nazi Party. Today the enemy is any dictator who believes they are “the only one who can fix it” and their personal power is more important than democracy. One hand has the power to cast a vote that can prevent a dictatorship. A hand can change history by voting against fear, greed, ignorance, bigotry, and intolerance. One hand can vote against war. John Heartfield stood up in a meeting to declare there was nothing more powerful than the human hand when the five fingers work together. The hand was a perfect symbol to show the power of resistance to fascism and dictators.